John said almost half of the population of Malawi is under the age of 15 and orphaned. The country is about the size of Ohio and has more than 12 million people. Two million of the residents of Malawi are wage earners with only one million people paying taxes. Half of these wage earners work for the Malawi government and an average daily wage is equal to one dollar. Father Mbeta and John have proposed an idea for another service project of our club. The school in Blantyre is in desperate need of renovations. The school is in the center of the town and is near the wells the club has built. Currently, the school has no windows, electricity, or running water. The children sit on pitted concrete floors. There are no desks or chairs in these classrooms that often have 100 kids per class. The project would install a clean water supply and bio-friendly sanitary system as well as desks, chairs, and books. The schools often double as a church in these villages. 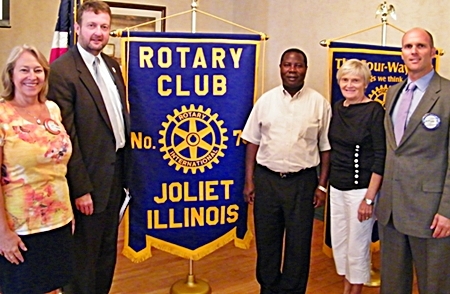 If the Rotary Club of Joliet can raise $11,000, Rotary International would double the contribution which would generate a total of $33,000 for the school project. This would yield approximately $50,000 in improvements at this school. The Rotary Club of Joliet will work with other area clubs to raise these funds.